Australian Inland Mission Memorial Cloister (VJ1 Memorial) commemorates those associated with the Australian Inland Mission and the Royal Flying Doctor Service. 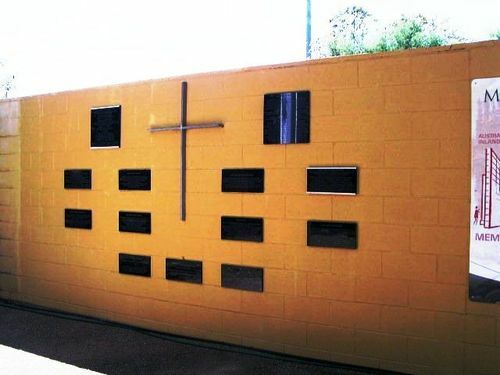 In 1969 a memorial cloister was built to display plaques relating the life of the pioneer- radio engineers and operators; the original flying doctors, the first aerial medical pilots and early patrol padres. The central feature is a steel standard representing an aerial mast on the exact position where the original station VJ1 had been. The masonry walls are open to the inland skies and unadorned to symbolize the humble everyday image of the serving church, while the cross of sacrifice unobtrusively represents the motive powers behind all true service. Due to the deterioration of the original site, the Cloister of Memorial Plaques, along with the ashes of the first flying doctor pilot Captain Arthur Affleck and dedicated wireless operator David Grieve Wyles were moved to the rear gardens of John Flynn Place Museum in 2003. The memorial was restored in 2012. The cloister was erected by the Board of the Australian Inland Mission in co- operation with the Royal Flying Doctor Service and in consultation with the Cloncurry Shire Council. Financial support also came from QANTAS. It was unveiled and dedicated 27 July 1969.